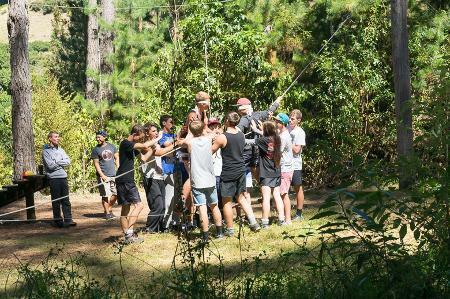 Get adventurous and enjoy team activities in our ropes course, set up amongst the trees in the Waihōanga Forest. The course has a range of options – so both beginners and more confident visitors can get stuck in straight away. We welcome all groups at the ropes course – so bring your friends, school groups, family or colleagues. Prices depend on group size and specific requirements and interests. The ropes course has its own private access so can be hired for half or full day activities, completely independently from any lodge bookings. Alternatively, you can make the ropes experience a unique part of your stay at the Waihōanga Centre. Enquire here for more information and availability. As well as being one of the owners at Waihōanga, Andy has over ten years experience working as a “level 3” industrial abseiler and another ten working as a professional sailor in high latitudes and on youth training vessels. He is not only comfortable at height, but has spent most of his professional life dangling off ropes, attached to lighthouses, tall buildings, and the masts of tall ships and yachts. He also has extensive experience in commercial health and safety operations associated with these activities. Building on this experience, Andy has oversight of the ropes course and works closely with all instructors who work at Waihōanga. Half day and full day programmes are available, which can be tailored to suit the needs, experience and goals of the individuals and groups. All safety equipment including harnesses, helmets, ropes and belay devices are provided. The ropes course is audited every year by Project Adventure New Zealand. 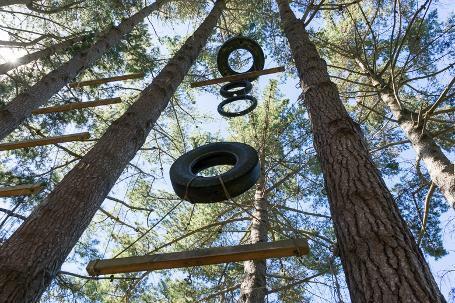 Click this link to learn more about the nine activities in the high ropes course.